Thanks to this game, play with your family wih Jules Verne stories! 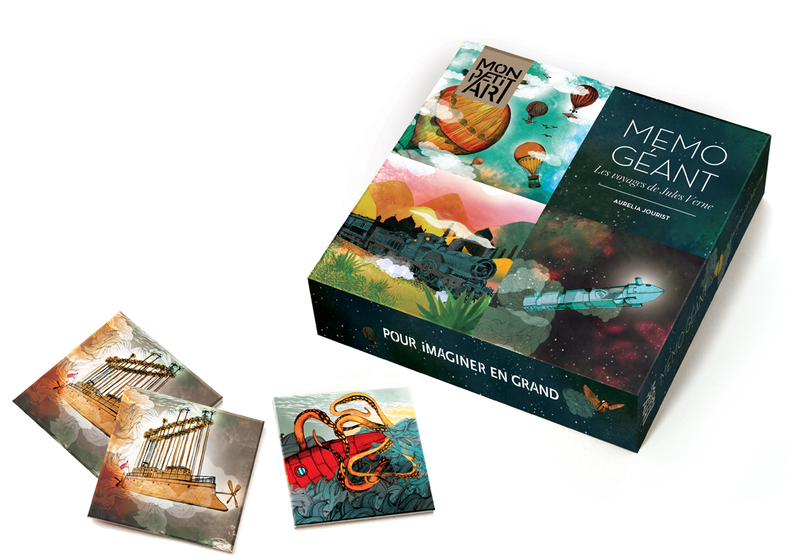 These cards will take you to an incredible journey, in fantastic machines, traveling in the air or down the ocean… Thanks to this game, grown-ups will be able to tell children about Jules Verne extraordinary trips. At the end of the 20th century, when sophisticated cars and sub marines were still dreams from some poetic minds, Jules Verne had yet invented fabulous engines and his characters lived intrepid adventures… Are you ready to play with Jules Verne? The big format card ( 11 x 11 cm ) allow you to occupy all the space you want. You can play on the table, but also on the floor; in that case, you might have to move and get up to go and find the cards... To play with Jules Verne, the rules are very simple; the 40 cards are lied face down. Each player can flip two cards at a time, for a few seconds, so that everyone can see them. The purpose of the game is to find all pairs of similar cards by remembering their position. Aurélia Jourist realized a great work of exploration; she read Jules Verne books again, so that every image corresponds to an extract of his stories. To give the impression that we get immersed in an old adventure book, she chose warm colors and put an “aged” effect on the images. Aurélia Jourist gave a particular attention to the machines. Indeed, submarines or flying machines are described very precisely by Jules Verne. Yet, the majority of its representations in the movies or cartoons are very far from what Jules Verne wrote! Therefore, to realize her drawings, Aurélia Jourist has contacted Jean-Marc Deschamps, a Jules Verne passionate who wrote a book dedicated to its machines: 140 years of extraordinary inventions. In his book, Jean-Marc Deschamps presents several models he made, imitating as faithfully as possible the engines that Jules Verne invented. Aurélia Jourist was inspired by those models when drawing ! Here are a few cards of the game with, for each one, the title of the book that inspired the illustration. Can you guess them? Your turn to play with Jules Verne! You enjoyed playing with Jules Verne? Discover the Giant Memo Game on our eshop!